Today, I had a phone conversation with one of our residents, the mother of a West Potomac High School junior. A new arrival to our area in July 2012, and an Army veteran, the mother came to our service area in search of better employment for herself and education opportunities for her daughter. But her income was never large, making the availability of affordable and suitable housing very limited — if not completely beyond her reach. Still, the family persevered. They always did their best and; soon enough, they found affordable rental housing through GSH. I remember the day when she came into our office to sign the lease on one of our Colchester Towne units. More than just our housing, the family always had a focus on improving their circumstances. The mother knew the value of steady work and her daughter the value of academic success. 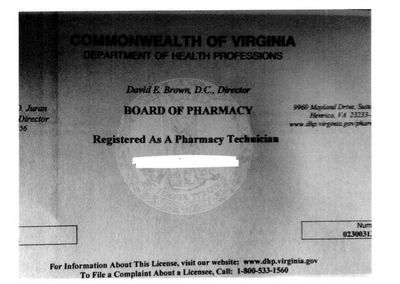 For example, I learned today that the daughter just passed her qualifying examination as a pharmacy technician in Virginia. Through an academy course offered at West Potomac High School, the daughter had an interest in pursuing the qualifications to become a pharmacy technician. Having scored well on the exam, the daughter was also selected for a competitive job internship at a local pharmacy — all while she continues her studies at West Potomac. You can see her new registration as a pharmacy technician in this photo. The phone call today also included a thank you for GSH. Having lost work hours following a bout of pneumonia, the mother didn’t have the money for her daughter’s test preparation course and for the costs of the exam itself. We hope to have more housing and life successes like her daughter’s and her own.